Our meals meet Government standards and are nutritionally analysed. 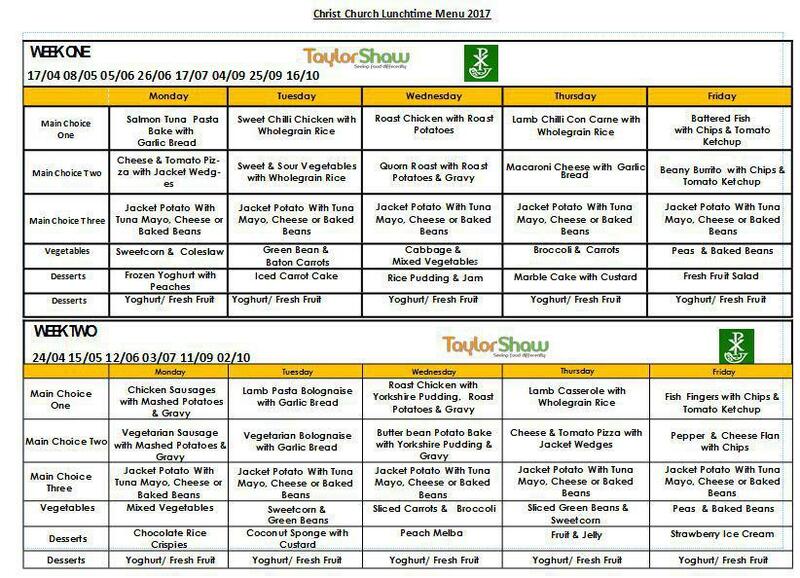 The menu changes termly and is posted on the notice board as well as in this area of the website. We are pleased to announce that meat and vegetarian alternatives will be provided every day. The cost of a School meal is £2.20 per day, £11 per week. The children have the choice of bringing either a packed lunch or having a school dinner. Children in Reception, Years 1 and 2 are entitled to a universal free school meal therefore you will not be charged for a school dinner. Please bring a packed lunch in a lunch box clearly marked with your child’s name. We encourage healthy eating and ask that children’s lunches do not contain chocolate bars, chewing gum, sweets, fizzy drinks, peanut butter or any foods containing nut products. Children have water available all day for them to drink. Fruit is provided as a snack which is also available all day. Children are able to access this independently in Reception and Nursery stop for a specific daily fruit break. If your child is under 5 years old, Cool Milk can provide them with free milk. We encourage all parents of children under 5 years old to register for free milk here.